It can sometimes feel that quite apart from her being a superb writer of murder mysteries virtually everything about Agatha Christie is a mystery. There is the disappearance of course, but far more than simply that. So much about her is difficult to explain: so much, in fact, is usually left unexplained. The nature of her reputation and her phenomenal fame, for example; how to judge or place her as a writer, or, something that is often implied in criticisms of her, whether she should be regarded as a ‘writer’ at all. And, her survival? That in itself is mysterious. The amount of attention paid to the disappearance can certainly seem a distraction, especially to those who want to argue for Christie’s work to be taken more seriously. Even so, it remains virtually impossible to ignore those eleven days from 3 December 1926 when, just as her career was beginning to take off, she left her home in Sunningdale, Berkshire, and vanished from public view, provoking a massive police and press hunt. We now know, in general terms, what she was doing during that time, but not, in any definitive sense, why she acted as she did. Her biographers continue to debate the issue and the popular media still use it as a standard tag of identity for her. Because Christie herself always refused to say anything about it, the disappearance has taken on a legendary life of its own. The controversy simply goes on, disputed today almost as strongly as it was ninety years ago. As is the way with legendary events, it is now unlikely that a solution acceptable to everyone will ever be advanced. Whatever it was exactly that happened to Christie on those missing days, we do know that it stayed deeply with her for the rest of her life. So traumatised was she by the press and public reaction that she retreated into a deeply private world from which she would never emerge, remaining affected by the disappearance in a variety of ways that are still little understood. She rarely spoke about her personal life or work, and would not willingly allow her opinion on any topic, however apparently innocuous it might seem, to be made public. It is instructive to read the rare interviews she did feel obliged to grant. They tend to reveal nothing that her readers might want to know about her and are notable for her deliberately bland responses to the interviewer’s questions. In her own work - whether in the form of pseudonymous romances, autobiography, plays, fables, or the detective stories on which her fame mainly rests - she is always the imaginative manipulative artist. All of this would have mattered less if she had been been a highly valued or refined literary novelist, or a conscious, even self-conscious experimental modernist: her removal from public life might then have been understood or treasured. But she wasn’t. She was a writer of detective stories, a branch of writing that was automatically classified as low on the literary scale. Furthermore, the detective stories she did write became regarded as little more than shallow if ingenious riddles, closer to to crossword puzzles than true novels and, therefore, only distantly connected with literature. As, according to this view, the stories had nothing other than their riddles to offer, it quickly became assumed that Christie was someone who possessed little interest in or understanding of the world around her, that she was a nostalgic purveyor of a faded, fast-vanishing or long-vanished image of England. At various times and with varying degrees of antagonism, she was portrayed as elitist, prudish, class-ridden, rather prim (priggish even), and nationalistic to the point of xenophobia; someone relentlessly snobbish and fascinated by the goings on of country-house society about which, apparently, she wrote endlessly, and thoughtlessly. At the heart of all of this there really is a mystery that demands to be solved, for it is very obviously the case that the work of no writer fitting such an image could ever have survived as long and as positively as Christie’s has done. Her novels would certainly not have been as consistently read and enormously enjoyed as we know they always have been (and still are) by such large numbers of people of different nationalities, age, gender, education and literary interests. It is not at all unusual for Christe’s readers to express personal affection for her, and gratitude for the many hours of reading pleasure she has given them. Would they respond in this way to a not very bright, nostalgic, elitist novelist whose only talent is for manufacturing artificial murder mysteries? 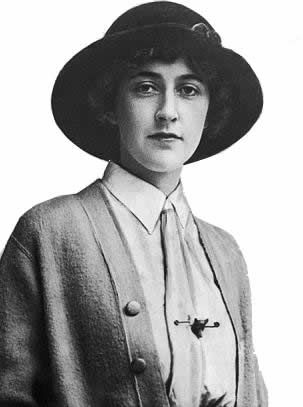 What we have in the case of Agatha Christie is a complete separation between the responses of readers and critics, with there being, within the span of Christie’s writing career, a virtual absence of almost any professional literary criticism that is ready and able to speak positively on her behalf. Such a possibility was swept away by the modernistic trends of the time, making it exceptionally difficult, undesirable even, to recognize anything that did not slot easily into the narrow categories of High Art and Low popular culture. At least this should have made it relatively easy, once Christie had been allotted her lower place, to keep her safely there, docketed as a best-seller, just that and nothing more. But in spite of the vast sales figures achieved by Christie’s novels, it is not feasible to explain away this exceptional popularity as some form of mind-numbing bestsellerism. That involves an entirely false view of literary history. ‘Bestsellers’, under which category Christie can be easily enough placed in a number of different ways, simply do not last through time in this way. When they survive at all, that is. Christie has done far more than survive. She has not only seen off the actual bestsellers of her own day, but also large numbers of other writers who during her own lifetime were called on to illustrate her inferiority. These include many of the once admired ‘literary’ novelists of the time, and also most of the other ‘golden-age’ writers of detective fiction, once Christie’s rivals, but who are now either ignored or neatly ensconced in their own historical niches. Compared with Christie, the large majority of these writers are now all but totally forgotten. One of the oddest things about her reputation as a novelist is that she herself was assiduous in helping to maintain its low status by her fierce belief that the work should be left to speak for itself. Her reluctance to make virtually any public statement about her life or art she explained away in terms of the extreme, almost chronic shyness from which she suffered. Not that this ever stopped her from writing and publishing far more than most other writers, or from achieving world-wide celebrity through her writing and, subsequently, through the modern mass media’s voracious interest in the disappearance. Her personal reticence was in fact, largely strategic. She liked to describe herself, in apparent innocence but actually as a way of mocking superior reviewers and condescending literary critics, as a ‘low brow’. They, of course, were ‘high brows’. This was a pose as well. She was, in truth, an extremely intelligent woman; largely self-educated, with a restless curiosity and intellect, well-informed on an exceptional number of subjects; a more than merely talented musician; well-read in literature of the present and the past, with an interest in devising psychological interpretations of Shakespeare’s plays, many of which find their way directly or indirectly into the novels. In public she appeared content to endorse the general view of herself as a compiler of entertaining detective stories, and understandably so. After all, this she most certainly was. But she was also a skilled, allusive, self-conscious and increasingly self-referential writer, determined that her novels should communicate on a number of different levels. As if all of this wasn’t enough, she was meticulous in striving to keep these and other talents hidden, and at this she has been a remarkable success, remaining still, in so many respects, a mystery still to be solved. Originally, I used this space on this website to upload a number of introductory articles exploring little understood aspects of Christie’s life and work. They focussed on Miss Marple whose possible personal links with Christie had long fascinated me. As much of the material contained in those articles has now been absorbed in my book Agatha Cristie and Shrewd Miss Marple, the articles no longer serve their earlier function. I have therefore removed most of them from the site, retaining in a modified form only those which contain material not otherwise fully represented in Agatha Christie and Shrewd Miss Marple. For the same reason, and more substantially, I have added to the site two entirely new articles: ‘Margaret Rutherford as Miss Marple’ and ‘St. Mary Mead and Crawley New Town’.